Taza, my dear, it's been a while since you and I last met. 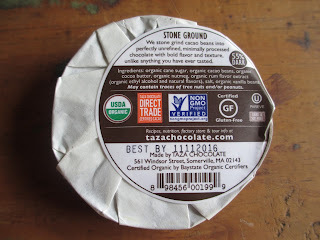 Having tried most of Taza Chocolate's offerings (though I think I've only reviewed a couple of them), I usually pass by their products these days in favor of new things. When I was at Montezuma Castle National Monument last week, though, the Taza display in their gift shop had this leftover from Christmas. It's the Winter Warmer Spiked Eggnog flavor. Christmas may be long gone, but the best by date isn't until November and I did really want to try this flavor. So here it is. Christmas in late April. And you know what? That works out pretty well because this chocolate turns out to not be very Christmasy after all. It's just nutmeg, rum flavor, and vanilla that have to carry the eggnog flavor and, well, there's only so much that they can get across on their own. As soon as you taste the chocolate, it has a creamy sort of sweetness; the cocoa content is low at 55%, so there is a lot of sugar in here (in a good way). Just a hint of spices come into the flavor, but not too much; it's more of an aftertaste. Then you get Taza's distinctive flavor and texture of sugar crystals at the end, followed by cool chocolate. I don't taste the rum at all, or anything that even reminds me of alcohol. So if I hadn't gone in thinking of eggnog, I doubt I would have known that's what the flavor this chocolate is supposed to convey. With that said, however, it's still a pretty good chocolate. It's cool and sweet while also warm and inviting. Taza's slightly crumbly, not quite gritty texture is always great--if you've never tried their chocolate definitely get some (it has that texture like Mexican hot chocolate, by the way, because it is stone ground). This texture plus the sweet, lightly spiced nature of this chocolate make it all too easy to munch away at. The two, eight-piece discs are the perfect size for either eating or using to make hot chocolate. 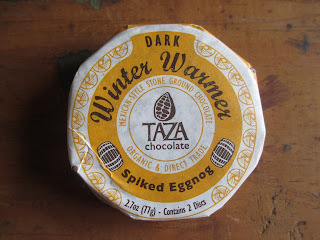 While I usually don't make hot chocolate from Taza, I might do so this time just out of curiosity. Maybe the added flavors will come out more once it's all heated. Oh, yes, and for the labels: organic, direct trade, non-GMO, dairy/soy-free (I called it slightly creamy in flavor, but rest assured that there is no cream). So basically another (mostly) successful Christmas offering of good quality chocolate (there aren't too many, especially in comparison to all of the terrible holiday chocolate) (and it would be more than "mostly" successful if it did a more recognizable representation of its chosen flavor of eggnog--but I still like it).